1. Prepare waffles: In food processor, combine potatoes, onions, eggs, flour, baking powder, salt and pepper; mix until blended. 2. Spray waffle iron with nonstick cooking spray. Pour in batter in and cook until golden brown. Repeat with remaining batter; keep warm. 3. Prepare sauce: In a large skillet over medium heat, heat cream until reduced by half. Add remaining ingredients, stirring until well incorporated. Keep warm until ready to serve. 4. 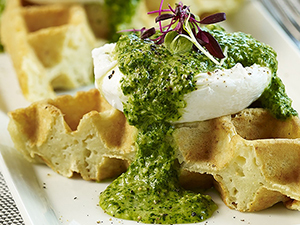 To assemble, place 3 poached eggs on top of waffles. Liberally drizzle the sauce over the eggs. Serve immediately.